Disney On Ice passed through Sacramento’s Sleep Train Arena last week with a performance of “Frozen,’ featuring an extended cast of familiar Disney icons as a part of their west coast tour. The performance will include singing, dancing, special effects and encourages audience participation, welcoming attendees of all ages. Sisters Elsa and Anna, the snowman Olaf, and friends Kristoff and Sven took to the ice as the show’s main characters. 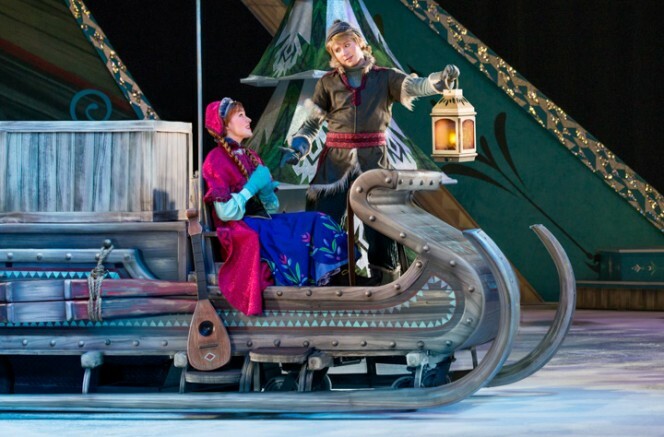 According to Kristoff’s actor, Jono Partridge, “Frozen” is unique among Disney On Ice’s productions in that it stays mostly faithful to the movie itself. “We’re the only Disney On Ice show out there that has one story from beginning to finish,” Partridge said. It’s only for the opening and final numbers that the show features cameos from other Disney characters. Though Partridge’s routine is acrobatic and intensive, he said that he always takes energy from the excited crowds that are as passionate about their favorite Disney characters as he is. Even when the tour takes its toll on the actors, Partridge pointed to Queen Elsa as a source of inspiration. Disney on Ice’s five day stay at Sacramento’s Sleep Train Arena is only a part of its larger west coast tour, following a tour of the United States’ opposite east coast. According to the show’s website, their shows average between one and a half to two hours, including a 15-20 minute intermission. The production includes a pre-show which skaters warm up and the audience is encouraged to prepare for the singing and dancing along with them. The final show at Sleep Train Arena was on the 15th will be at 12:00 p.m. and 4:00 p.m.
Be the first to comment on "Disney on Ice’s ‘Frozen’ skates through Sacramento"